Mold is a common household nuisance that affects your bank account as well as your health. It can cost you thousands of dollars in property damage while also making you sick. What most people don’t realize is that mold can be a hazard outside of the home as well. 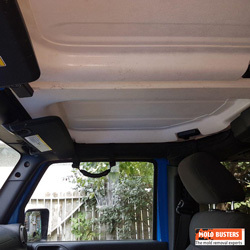 It can grow in some unexpected areas including the inside of your car. 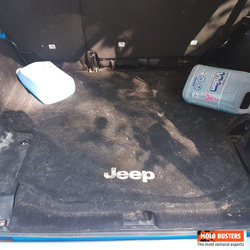 In this article, you will learn how to identify and safely clean up mold growing in your vehicle. What causes mold in the car? Mold forms when damp conditions mix with a warm environment. Unfortunately, this makes your car an ideal breeding ground for the fungus. 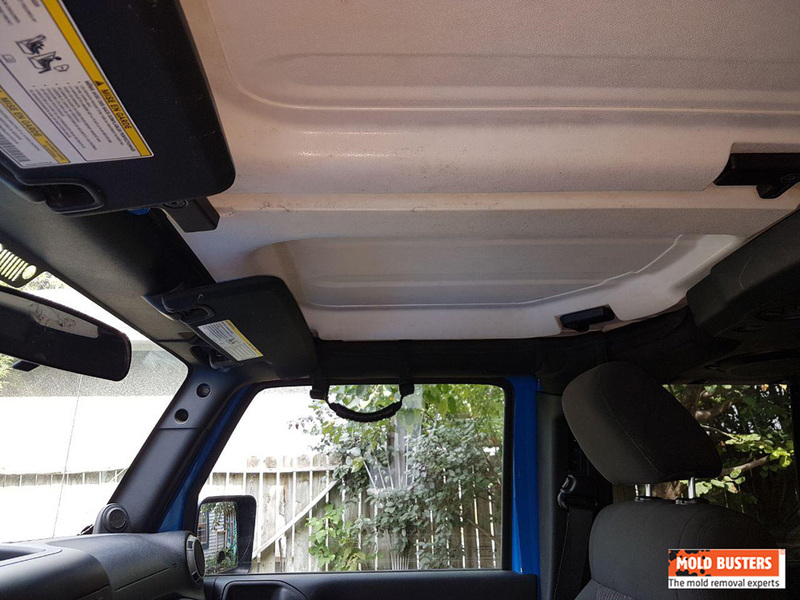 One common cause of mold in cars is water entering through a cracked or poorly sealed sunroof on a rainy day. Another is a spilled drink that wasn’t properly cleaned and dried from the seats or carpets. When does mold in the car appear? The appearance of mold is fast-acting and widespread. It forms as quickly as two to three days after an incident. Learn more about how fast can black mold spread. Mold has a musty, unpleasant odor — you will likely smell it before you see it. Some describe it as smelling like wet socks or rotten wood. 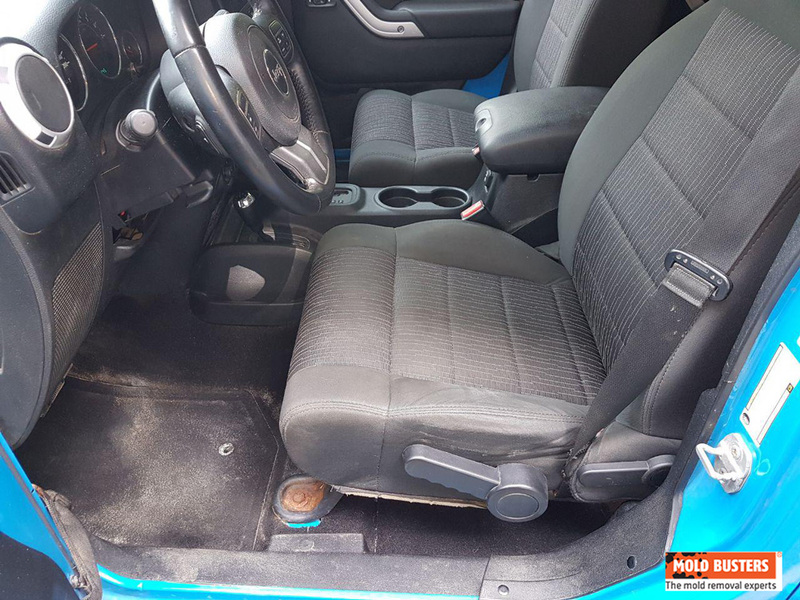 What is the difference between mildew and mold in the car? Mildew and mold share some similarities in appearance and smell, so it can be easy to confuse the two at first. 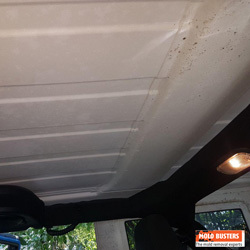 Mildew appears as patches of white or grey fungus on damp surfaces in or on your car. It is less of a threat and more of an inconvenience. You can remove mildew yourself with a scrub brush and bottle of cleaner. 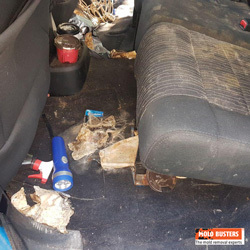 Mold, on the other hand, is a widespread issue that poses serious health risks to you and your passengers. It can be fuzzy or slimy in appearance and comes in a variety of colours. If you suspect the presence of mold in your car, do as you would if you found mold in your home—remove it promptly. And DO NOT run the air conditioning fans as this could disperse the mold spores in the air, making them easier for you to inhale. 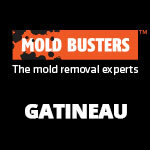 For more about difference between mold and mildew checkout our case study here. 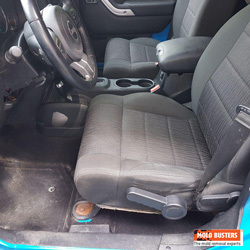 Video: How to get rid of mold in car? What are the different types of mold that can grow in your car? There are over a 100,000 species of mold in the world. Estimates show that there are more than a thousand species of green mold alone. This can make it difficult to identify which one is targeting your car. The three most common types are white, blue and green. These types fall under the Penicillium genus and were once used as an ingredient in the production of the antibiotic penicillin (1). Yellow, or Aspergillus mold, which we breathe in daily without sickness according to the CDC. However, contact should still be limited since overexposure can negatively affect your health. Brown mold, which is common in the Cladosporium genus. It grows both outdoors on plants and indoors on damp carpets and fabric seats. Mold that has an olive-green or grey tinge is from the same family. Grey or black molds, called Alternaria, are common outdoor molds that grow in damp, dusty areas. They usually affect soil and plants, but can also grow indoors given the right conditions. Alternaria can sometime appear black and be mistaken for toxic black mold. Greenish-black mold or toxic black mold, is the most dangerous of them all. It is part of the Stachybotrys genus and is infamous for its severe and, at times, deadly health effects. 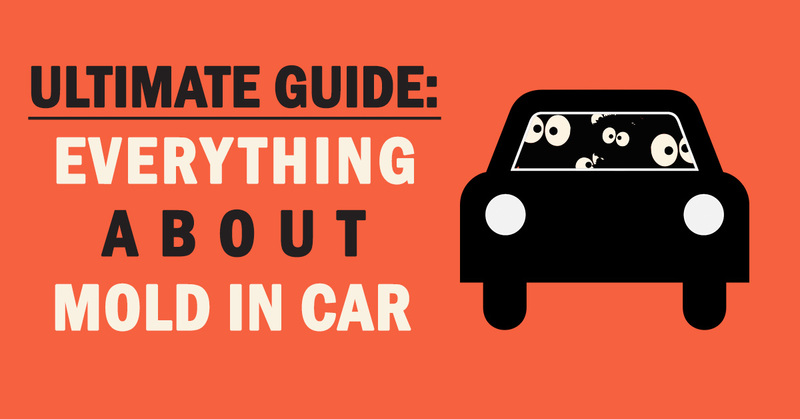 Where does mold appear in your car? 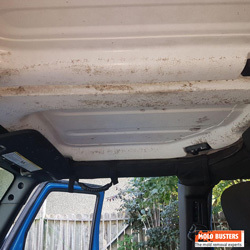 Mold can appear almost anywhere in or on your car. 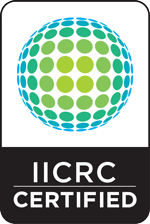 The most affected areas are rugs, carpets, seats and other fabrics/textiles. 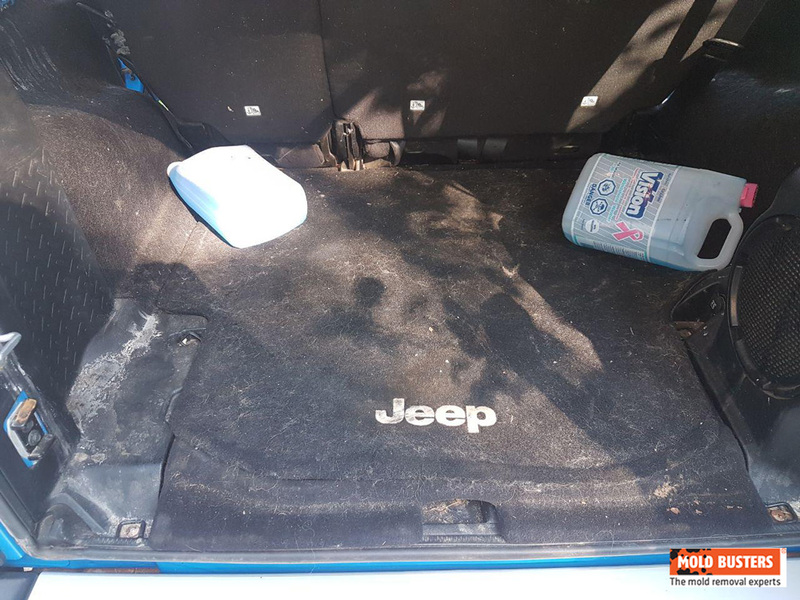 As stated earlier, it is not uncommon for mold to form in your car after a liquid is spilled. 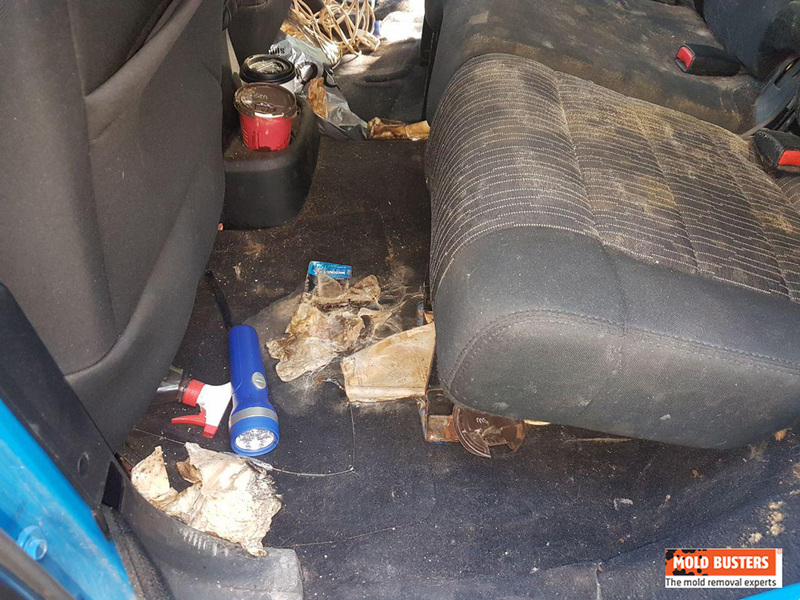 This occurs if there is a lack of ventilation in the car and the spill is not properly dried. The good news—spills usually cause only surface mold on your car’s interior. This type of mold is easier to spot, making it easier to clean. 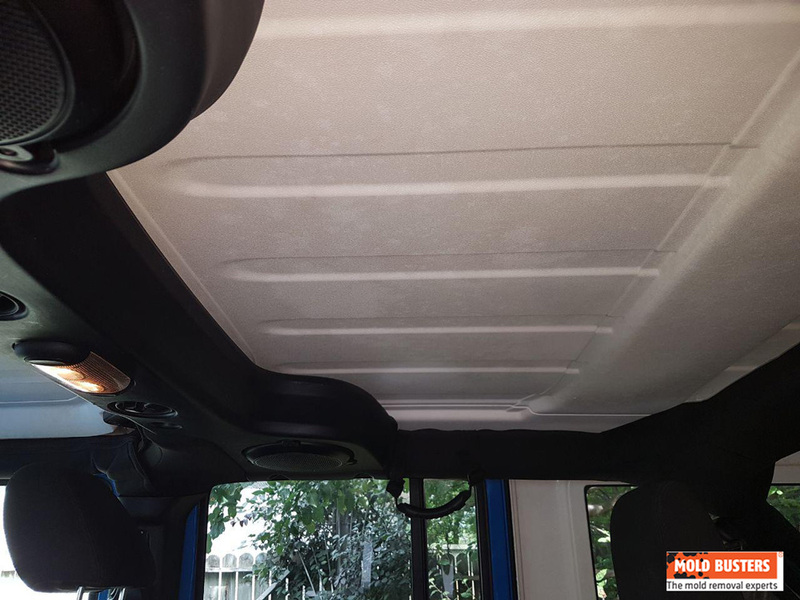 However, more serious moisture problems can occur in areas of your car that are harder to access and therefore harder to clean up. 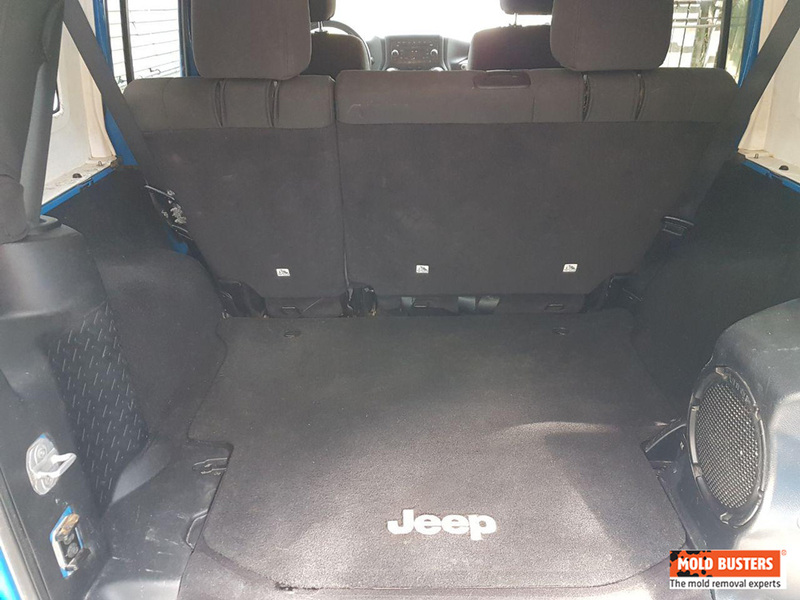 This includes the car’s upholstery, seat foam, vents, air conditioners, doors, trunk or boot. 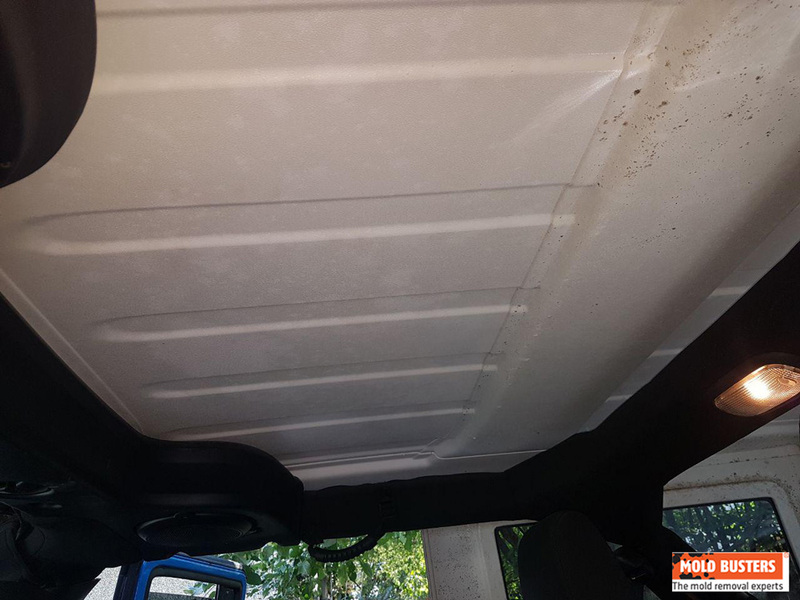 These types of spills usually occur if the sunroof is left open during a rain storm. You might think that a bit of water would do little harm to your car, but this is not the case. 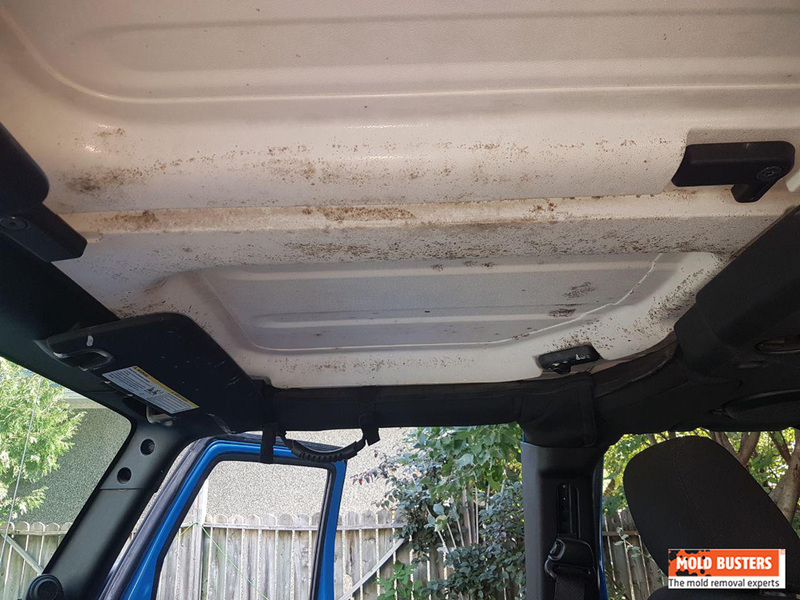 Mold will very quickly begin to grow if the vehicle is not left open in a warm, well-lit area to dry. Keeping the doors and windows closed will slow down the drying process and put your car at serious risk. The same will happen if moisture seeps into the car’s air conditioner or vents. 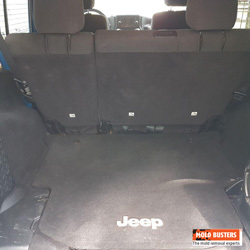 Another common but often forgotten area of your car where mold is known to form is the trunk or boot. Mold can form here if damp clothing or supplies are forgotten and left inside for extended periods of time. This could include a bag of sweaty gym clothes or a pile of damp cleaning rags. What are the health risks associated with mold in the car? A number of health risks are associated with exposure to mold. People with mold allergies will have severe allergic reactions upon contact with mold spores. Mold exposure also increases sensitivity in those with asthma or an autoimmune disease. Passengers with chronic lung illnesses, such as obstructive lung disease, could face infection as well. “Aspergillosis” and “chronic pulmonary aspergillosis” have been linked to mold. Aspergillosis causes coughing, wheezing and sinus inflammation. Chronic pulmonary aspergillosis is a painful condition that causes cavities in the lungs. These cavities are called “fungus balls” and can lead to future scarring (2). How do I know if I have mold in my car? Trust your sense of smell—if you smell mold in your car, there is a big chance that it is there. First check for items in the car that could be the culprit as opposed to the car itself. We recommend calling a professional to test your vehicle for you. 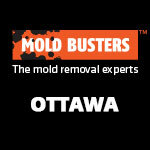 At Mold Busters, we can provide you with the most accurate results for a reasonable set fee. The process is simple. 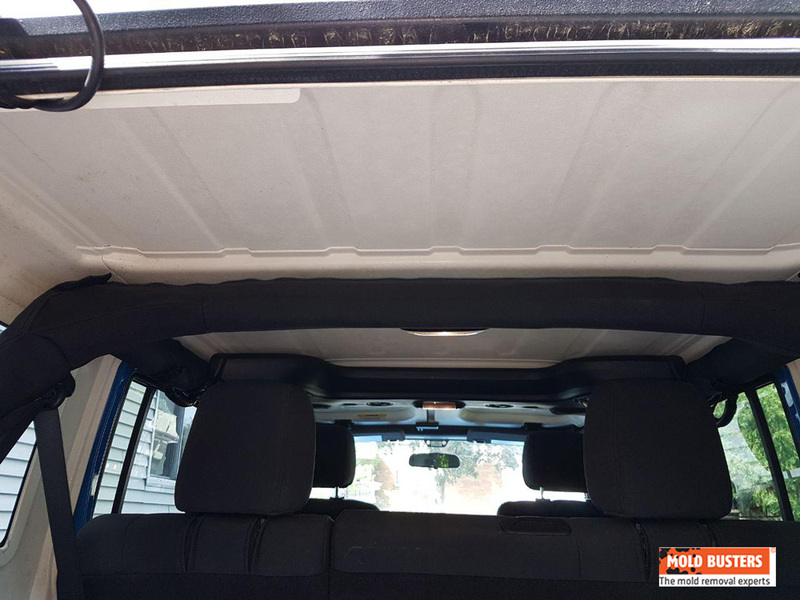 You book a mold inspection; a certified mold inspector arrives and conducts a full visual assessment of your car; he takes a swab test to confirm or deny the presence of mold; and he provides you with the results within minutes. 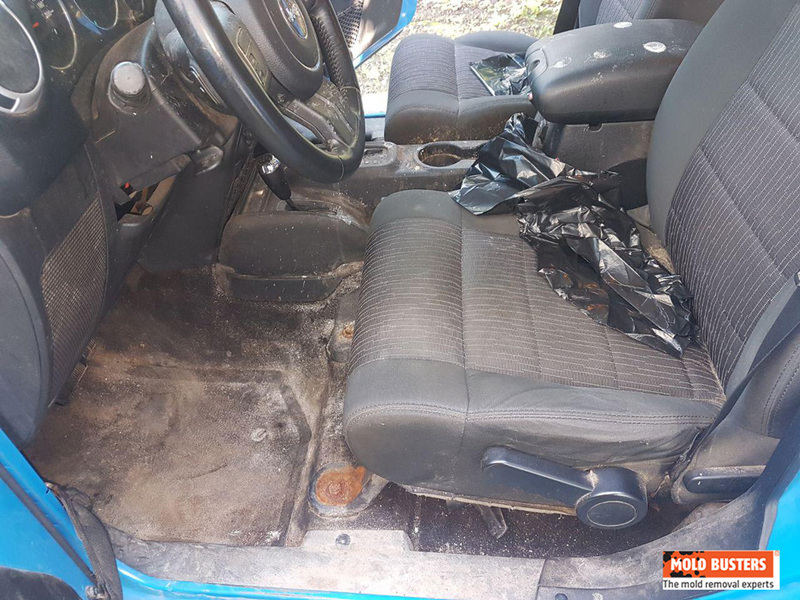 Are there any DIY methods for removing mold in my car? If you find mold in your car, the first step is to prevent further contamination and stop it from spreading. Move your car out of the shade and into a well-lit area with direct sunlight. Open all windows and doors in order to air out the vehicle. Before you start the mold removal process, buy a dust mask from your local hardware store. Wearing a dust mask will reduce the risk of inhaling any toxic spores while you clean your car. Avoid the use of heavy duty cleaning products like ammonia or bleach. These products can stain surfaces and kill only surface mold. Borax mixed with water eliminates mold while also reducing the risk of stains. This is due to its high pH level, which is an enemy to mold, but safe for human use. Lysol offers the same solution, though it does contain small amounts of bleach. Another popular remedy is a homemade solution of vinegar and distilled water. This offers a safe chemical-free way to kill mold. DIY solutions might seem like the way to go, but they come with their own set of risks. Missed trace particles of mold will lead to further growth. This will put you and your loved ones at risk of exposure-related illnesses. It is also difficult to conduct an accurate mold test on your own without the proper tools or professional help. 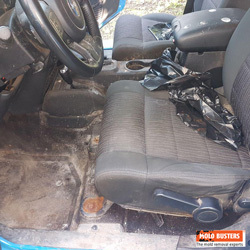 Many drivers will choose a DIY method to cut costs, but a botched mold removal job could cost you more in the long run. 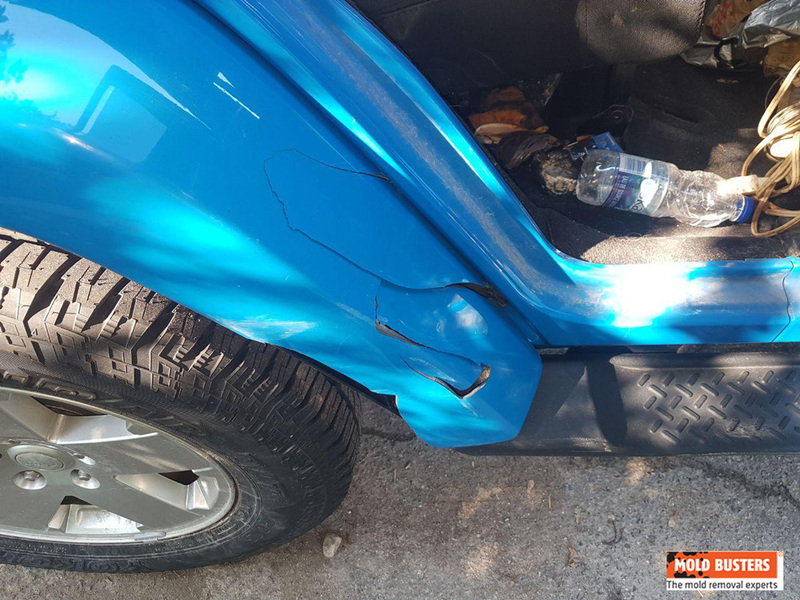 Some cars become so damaged by mold that they become write-offs. 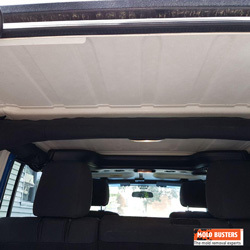 The safest and most efficient way to remove mold from your car is to seek out the services of a professional. Mold can pose a serious health risk to you and your loved ones, and at Mold Busters we are happy to reduce the risk for you. 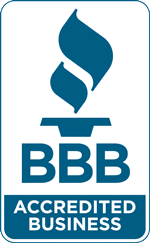 We offer quality professional services in mold inspection, testing, and removal. We will come to you and conduct an on-site mold test to determine if there are mold particles in your car. 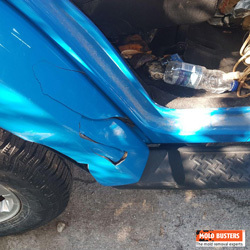 We can also remove a sample of the offending substance from your car and test it in order to determine the exact genus and species of mold present. These methods allow us to determine the extent and severity of the contamination in order to better plan out the mold remediation. 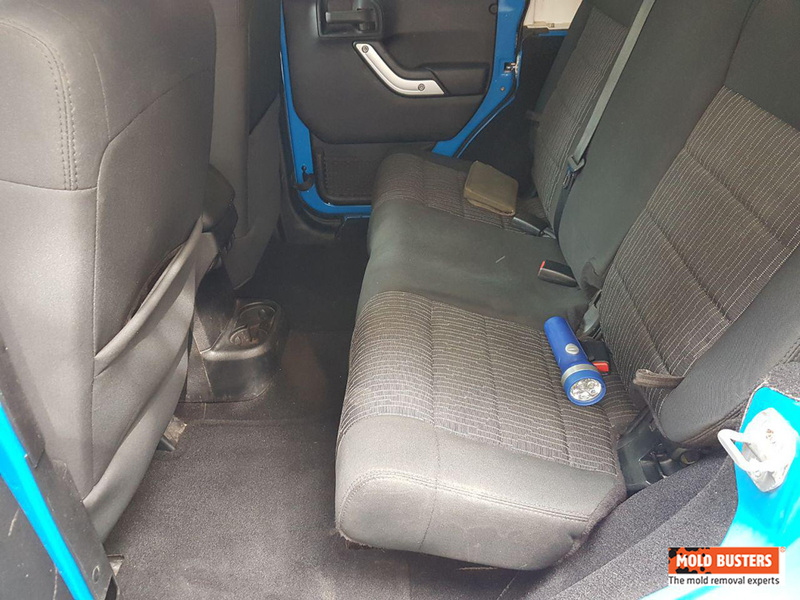 Once the scope of work has been set out, we will then proceed with removing the mold from your vehicle and even eliminate any residual mold odors. We do this through the use of air filters, air scrubbers and ozone generators. 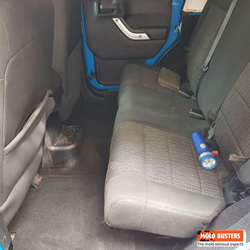 How to prevent mold in the car? 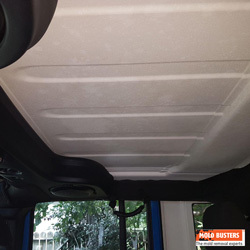 The easiest way to prevent mold in your car is to stop moisture from entering it. Clean up and dry spills the moment that they occur and check for any cracks or open areas in your car. Double-check that your windows and sunroof are closed when you are not in the vehicle to prevent rain from entering it during storms. Finally, be alert and on the lookout for any signs of water damage or other potential issues. All it takes is a bit moisture and a warm contained environment for mold to grow. Protect yourself and your loved ones from exposure by keeping your car clean and safe. 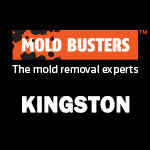 For more information about our services, call Mold Busters today! 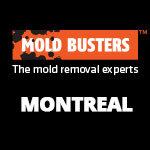 We are happy to answer any questions that you have about mold testing, removal and odor control.